Postopolis! LA has been gathering pace over the past few weeks, despite the silence, so it seemed like high time for an update. Although we're still finalizing both the schedule and the list of speakers, it's looking amazing so far. The whole thing kicks off in less than two weeks, running from Tuesday, March 31, to Saturday, April 4, and from 5pm-11pm everyday. The venue has finally been announced, as well: we'll be up in the sky, watching the sun set every evening from the rooftop pool, deck, and bar of the Standard Hotel in downtown Los Angeles. The event is free and open to everyone, with a cash bar and free wifi, so come on down for some landscape and architecture, bring your favorite wireless device, and wear your Speedo or bikini if you want to use the pool (it's more like a wading pool, FYI). And, of course, we'll be keeping our fingers crossed for no rain. That's nowhere near the final list, though, as we've also got a handful of media panels planned for Saturday, April 4; these will include Matt Chaban from the Architect's Newspaper, Dakota Smith from Curbed LA, Greg J. Smith of Serial Consign & Vague Terrain, journalist Alissa Walker, a variety of Archinect school bloggers, and many, many more. 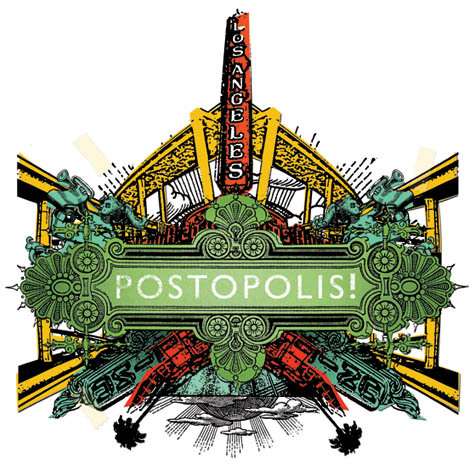 And, don't forget, Postopolis! LA will be hosted by BLDGBLOG, City of Sound, mudd up!, Plataforma Arquitectura/Arch Daily, Subtopia, and we make money not art, under the organization of the Storefront for Art and Architecture and the sponsorship of ForYourArt. Names (including fabric | ch) at Postopolis!LA.